Is eating helping you or hindering you from reaching your potential? Do you have dreams for yourself? Do you know who you are meant to be but can’t seem to get there? How you eat can be a perfect way to see how you stop yourself from reaching your potential. When facing challenges around mindful eating, an insight that often emerges for people is the spiritual nature of the process of exploring physical hunger and eating. When we mediate our self-worth through the size of our body or through conformity to certain eating expectations that don’t relate to our distinct and unique needs, we are distorting and diminishing ourselves. Adding insult to injury: the truly sad part is that we are doing it to ourselves. The intuitive eating guidelines–eat when you’re physically hungry, eat what your body wants you to eat, and stop as soon as the hunger goes away–call upon us to distinguish physical hunger from all the other hungers we have, and then lovingly, thoughtfully and attentively nourish all of them individually. Many of us use food to feed spiritual hungers, and then cannot figure out why it is hard to stop eating what we don’t really want to eat or when we don’t want to eat. But by feeding our physical hunger and only our physical hunger with food, we show up for ourselves. It gives us grounding that allows us both to weather what is difficult without being overcome and the sustenance to reach out in our aspirations. 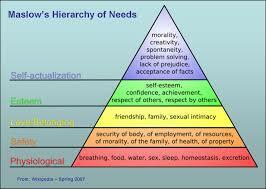 I have been thinking of the psychologist Abraham Maslow’s ‘hierarchy of needs’ in this regard. He proposed understanding the possibility of fulfilling our human potential in terms of tending to levels of ascending and narrowing needs from the basic to the august. Maslow illustrated this in terms of a pyramid with five levels: the needs of physiology, for safety and security, for love and belonging, for self esteem that all come together in the pinnacle of self-actualization. We only advance as the needs of each level are satisfied. If they are not, we remain thwarted at the level we’re at. When it comes to eating and the pyramid, two things leap out at me. Taking the ground floor view: if our relationship to food is fraught we stay stuck at the bottom, at physiological level. If we let ourselves get too hungry, if we fill our bodies with excessive sugar, if we deny ourselves food’s pleasure, if we get preoccupied with diets or negative body talk, if we get so full we don’t want to move, it will affect and limit everything about ourselves all the way up the line. We can see why tuning into and satisfying our physical hunger with good food is so powerful. Not properly, amply, respectfully and consistently feeding ourselves is one of the biggest forms of self-sabotage there is. Taking a nuanced view, disharmony here is insidious. Food is not merely a basic necessity and building block. Consider that our initial relationship, be that at the breast or with the bottle, is ideally in the arms of a loving and nurturing person. As a result, it was through food that we had our fundamental experiences of physical nurturing related to level one and of psychological nurturing: level two’s safety and security and level three’s love and belonging. We see why we turn to or away from food in difficult situations. But when we do, we haven’t allowed for separation of the levels, and we interfere with a basic equilibrium. Feeding our physical hunger with food and only using food for that leaves open the space for us to hear what our spirits are hungry for, and permits us to be in the best position to tend to them. Mindfully feeding our physical hunger infuses three of the four levels of Maslow’s pyramid. This is essential in being able to feed our soul in a way that we can to advance to the levels of self-love and self-actualization. Intuitive hunger eating is a key in allowing us to become all we dream of being. Is your relationship to eating holding you back? How does it hold you back? Does it preoccupy you? Does it make you doubt yourself? It doesn’t have to. 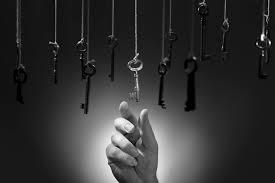 In fact, it holds the answers to releasing you and expanding your life if you have the courage to look.